As an extension of its year-round Invent for Good initiative, littleBits is encouraging creators who use its Bits and kits to extend that "think of others" mindset to Mother Earth. So just ahead of Earth Day, the company is asking students of all ages to think about how they would clean, save, or protect our planet—if they could create any invention they wanted—by hosting a social media competition. 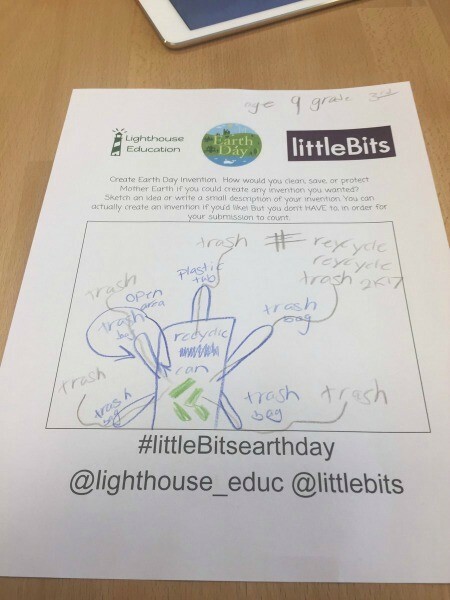 Participants can sketch an idea, write a small description of their invention, or even create an invention with littleBits (optional), then post it to Twitter or Instagram with #littleBitsEarthDay. The winner will be able to choose a prize of either $100 worth of Bits or a $99 littleBits kit of his or her choice. Here's an example of one submission already received, from students in Riverwoods, IL (via teacher Amy Schneider). Multiple entries are allowed, but all of them must be in by 11:59 p.m. EDT on Friday, April 21, 2017. The winner will be announced on Earth Day, Saturday, April 22.